"Radioactive" and "Radioactivity" redirect here. For other uses, see Radioactive (disambiguation) and Radioactivity (disambiguation). The decaying nucleus is called the parent radionuclide (or parent radioisotope[note 2]), and the process produces at least one daughter nuclide. Except for gamma decay or internal conversion from a nuclear excited state, the decay is a nuclear transmutation resulting in a daughter containing a different number of protons or neutrons (or both). When the number of protons changes, an atom of a different chemical element is created. The first decay processes to be discovered were alpha decay, beta decay, and gamma decay. Alpha decay occurs when the nucleus ejects an alpha particle (helium nucleus). This is the most common process of emitting nucleons, but highly excited nuclei can eject single nucleons, or in the case of cluster decay, specific light nuclei of other elements. Beta decay occurs in two ways: (i) beta-minus decay, when the nucleus emits an electron and an antineutrino in a process that changes a neutron to a proton, or (ii) beta-plus decay, when the nucleus emits a positron and a neutrino in a process that changes a proton to a neutron. Highly excited neutron-rich nuclei, formed as the product of other types of decay, occasionally lose energy by way of neutron emission, resulting in a change from one isotope to another of the same element. The nucleus may capture an orbiting electron, causing a proton to convert into a neutron in a process called electron capture. All of these processes result in a well-defined nuclear transmutation. It soon became clear that the blackening of the plate had nothing to do with phosphorescence, as the blackening was also produced by non-phosphorescent salts of uranium and by metallic uranium. It became clear from these experiments that there was a form of invisible radiation that could pass through paper and was causing the plate to react as if exposed to light. Marie and Pierre Curie's study of radioactivity is an important factor in science and medicine. After their research on Becquerel's rays led them to the discovery of both radium and polonium, they coined the term "radioactivity". Their research on the penetrating rays in uranium and the discovery of radium launched an era of using radium for the treatment of cancer. Their exploration of radium could be seen as the first peaceful use of nuclear energy and the start of modern nuclear medicine. Other experimenters, including Elihu Thomson and Nikola Tesla, also reported burns. Thomson deliberately exposed a finger to an X-ray tube over a period of time and suffered pain, swelling, and blistering. Other effects, including ultraviolet rays and ozone, were sometimes blamed for the damage, and many physicians still claimed that there were no effects from X-ray exposure at all. Despite this, there were some early systematic hazard investigations, and as early as 1902 William Herbert Rollins wrote almost despairingly that his warnings about the dangers involved in the careless use of X-rays were not being heeded, either by industry or by his colleagues. By this time, Rollins had proved that X-rays could kill experimental animals, could cause a pregnant guinea pig to abort, and that they could kill a fetus. He also stressed that "animals vary in susceptibility to the external action of X-light" and warned that these differences be considered when patients were treated by means of X-rays. After World War II, the increased range and quantity of radioactive substances being handled as a result of military and civil nuclear programmes led to large groups of occupational workers and the public being potentially exposed to harmful levels of ionising radiation. This was considered at the first post-war ICR convened in London in 1950, when the present International Commission on Radiological Protection (ICRP) was born. Since then the ICRP has developed the present international system of radiation protection, covering all aspects of radiation hazard. The International System of Units (SI) unit of radioactive activity is the becquerel (Bq), named in honor of the scientist Henri Becquerel. One Bq is defined as one transformation (or decay or disintegration) per second. The effects of ionizing radiation are often measured in units of gray for mechanical or sievert for damage to tissue. Early researchers found that an electric or magnetic field could split radioactive emissions into three types of beams. The rays were given the names alpha, beta, and gamma, in increasing order of their ability to penetrate matter. Alpha decay is observed only in heavier elements of atomic number 52 (tellurium) and greater, with the exception of beryllium-8 which decays to two alpha particles. The other two types of decay are produced by all of the elements. Lead, atomic number 82, is the heaviest element to have any isotopes stable (to the limit of measurement) to radioactive decay. Radioactive decay is seen in all isotopes of all elements of atomic number 83 (bismuth) or greater. Bismuth-209, however, is only very slightly radioactive, with a half-life greater than the age of the universe; radioisotopes with extremely long half-lives are considered effectively stable for practical purposes. If energy circumstances are favorable, a given radionuclide may undergo many competing types of decay, with some atoms decaying by one route, and others decaying by another. An example is copper-64, which has 29 protons, and 35 neutrons, which decays with a half-life of about 12.7 hours. 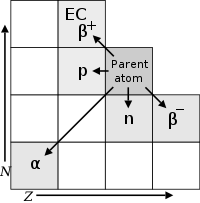 This isotope has one unpaired proton and one unpaired neutron, so either the proton or the neutron can decay to the other particle, which has opposite isospin. This particular nuclide (though not all nuclides in this situation) is almost equally likely to decay through positron emission (18%), or through electron capture (43%), as it does through electron emission (39%). The excited energy states resulting from these decays which fail to end in a ground energy state, also produce later internal conversion and gamma decay in almost 0.5% of the time. The decay constant— λ, "lambda" the reciprocal of the mean lifetime, sometimes referred to as simply decay rate. Radioactivity is one very frequently given example of exponential decay. The law describes the statistical behaviour of a large number of nuclei, rather than one individual nucleus. In the following formalism, the number of nuclei or the nuclei population N, is of course a discrete variable (a natural number)—but for any physical sample N is so large that it can be treated as a continuous variable. Differential calculus is used to model the behaviour of nuclear decay. In 1992, Jung et al. of the Darmstadt Heavy-Ion Research group observed an accelerated β− decay of 163Dy66+. Although neutral 163Dy is a stable isotope, the fully ionized 163Dy66+ undergoes β− decay into the K and L shells to 163Ho66+ with a half-life of 47 days. Example of diurnal and seasonal variations in gamma ray detector response. Recent results suggest the possibility that decay rates might have a weak dependence on environmental factors. It has been suggested that measurements of decay rates of silicon-32, manganese-54, and radium-226 exhibit small seasonal variations (of the order of 0.1%). However, such measurements are highly susceptible to systematic errors, and a subsequent paper has found no evidence for such correlations in seven other isotopes (22Na, 44Ti, 108Ag, 121Sn, 133Ba, 241Am, 238Pu), and sets upper limits on the size of any such effects. The decay of radon-222 was once reported to exhibit large 4% peak-to-peak seasonal variations (see plot), which were proposed to be related to either solar flare activity or the distance from the Sun, but detailed analysis of the experiment's design flaws, along with comparisons to other, much more stringent and systematically controlled, experiments refute this claim. An unexpected series of experimental results for the rate of decay of heavy highly charged radioactive ions circulating in a storage ring has provoked theoretical activity in an effort to find a convincing explanation. The rates of weak decay of two radioactive species with half lives of about 40 s and 200 s are found to have a significant oscillatory modulation, with a period of about 7 s. The observed phenomenon is known as the GSI anomaly, as the storage ring is a facility at the GSI Helmholtz Centre for Heavy Ion Research in Darmstadt, Germany. As the decay process produces an electron neutrino, some of the proposed explanations for the observed rate oscillation invoke neutrino properties. Initial ideas related to flavour oscillation met with skepticism. A more recent proposal involves mass differences between neutrino mass eigenstates. The combined effects of these forces produces a number of different phenomena in which energy may be released by rearrangement of particles in the nucleus, or else the change of one type of particle into others. These rearrangements and transformations may be hindered energetically, so that they do not occur immediately. In certain cases, random quantum vacuum fluctuations are theorized to promote relaxation to a lower energy state (the "decay") in a phenomenon known as quantum tunneling. Radioactive decay half-life of nuclides has been measured over timescales of 55 orders of magnitude, from 2.3 × 10−23 seconds (for hydrogen-7) to 6.9 × 1031 seconds (for tellurium-128). The limits of these timescales are set by the sensitivity of instrumentation only, and there are no known natural limits to how brief or long a decay half-life for radioactive decay of a radionuclide may be. The decay process, like all hindered energy transformations, may be analogized by a snowfield on a mountain. While friction between the ice crystals may be supporting the snow's weight, the system is inherently unstable with regard to a state of lower potential energy. A disturbance would thus facilitate the path to a state of greater entropy; the system will move towards the ground state, producing heat, and the total energy will be distributable over a larger number of quantum states thus resulting in an avalanche. The total energy does not change in this process, but, because of the second law of thermodynamics, avalanches have only been observed in one direction and that is toward the "ground state" — the state with the largest number of ways in which the available energy could be distributed. Such a collapse (a gamma-ray decay event) requires a specific activation energy. For a snow avalanche, this energy comes as a disturbance from outside the system, although such disturbances can be arbitrarily small. In the case of an excited atomic nucleus decaying by gamma radiation in a spontaneous emission of electromagnetic radiation, the arbitrarily small disturbance comes from quantum vacuum fluctuations. A radioactive nucleus (or any excited system in quantum mechanics) is unstable, and can, thus, spontaneously stabilize to a less-excited system. The resulting transformation alters the structure of the nucleus and results in the emission of either a photon or a high-velocity particle that has mass (such as an electron, alpha particle, or other type). The Szilard–Chalmers effect is defined as the breaking of a chemical bond between an atom and the molecule that the atom is part of, as a result of a nuclear reaction of the atom. The effect can be used to separate isotopes by chemical means. The discovery of this effect is due to Leó Szilárd and Thomas A. Chalmers. Radioactive primordial nuclides found in the Earth are residues from ancient supernova explosions that occurred before the formation of the solar system. They are the fraction of radionuclides that survived from that time, through the formation of the primordial solar nebula, through planet accretion, and up to the present time. The naturally occurring short-lived radiogenic radionuclides found in today's rocks, are the daughters of those radioactive primordial nuclides. Another minor source of naturally occurring radioactive nuclides are cosmogenic nuclides, that are formed by cosmic ray bombardment of material in the Earth's atmosphere or crust. The decay of the radionuclides in rocks of the Earth's mantle and crust contribute significantly to Earth's internal heat budget. The daughter nuclide of a decay event may also be unstable (radioactive). In this case, it too will decay, producing radiation. The resulting second daughter nuclide may also be radioactive. This can lead to a sequence of several decay events called a decay chain (see this article for specific details of important natural decay chains). Eventually, a stable nuclide is produced. Any decay daughters that are the result of an alpha decay will also result in helium atoms being created. ^ See Wu experiment among other counterexamples when the decaying atom is influenced by external factors. ^ Radionuclide is the more correct term, but radioisotope is also used. The difference between isotope and nuclide is explained at Isotope#Isotope vs. nuclide. ^ Stabin, Michael G. (2007). "3". 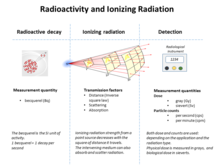 Radiation Protection and Dosimetry: An Introduction to Health Physics. Springer. doi:10.1007/978-0-387-49983-3. ISBN 978-0-387-49982-6. ^ Best, Lara; Rodrigues, George; Velker, Vikram (2013). "1.3". Radiation Oncology Primer and Review. Demos Medical Publishing. ISBN 978-1-62070-004-4. ^ Loveland, W.; Morrissey, D.; Seaborg, G.T. (2006). Modern Nuclear Chemistry. Wiley-Interscience. p. 57. Bibcode:2005mnc..book.....L. ISBN 978-0-471-11532-8. ^ Litherland, A.E. ; Ferguson, A.J. (1961). "Gamma-Ray Angular Correlations from Aligned Nuclei Produced by Nuclear Reactions". Canadian Journal of Physics. 39 (6): 788–824. Bibcode:1961CaJPh..39..788L. doi:10.1139/p61-089. ISSN 0008-4204. ^ "3. Nuclear and Atomic Spectroscopy". Spectroscopy. Methods in Experimental Physics. 13. 1976. pp. 115–346. Bibcode:1976MExP...13..115.. doi:10.1016/S0076-695X(08)60643-2. ISBN 9780124759138. ^ Martin, B.R. (31 August 2011). Nuclear and particle physics: An introduction (2nd ed.). John Wiley & Sons. p. 240. ISBN 978-1-1199-6511-4. ^ Mould, Richard F. (1995). A century of X-rays and radioactivity in medicine : with emphasis on photographic records of the early years (Reprint. with minor corr ed.). Bristol: Inst. of Physics Publ. p. 12. ISBN 978-0-7503-0224-1. ^ a b L'Annunziata, Michael F. (2007). Radioactivity: Introduction and History. Amsterdam, Netherlands: Elsevier Science. p. 2. ISBN 9780080548883. ^ Hrabak, M.; Padovan, R.S. ; Kralik, M.; Ozretic, D.; Potocki, K. (July 2008). "Nikola Tesla and the Discovery of X-rays". RadioGraphics. 28 (4): 1189–92. doi:10.1148/rg.284075206. PMID 18635636. ^ Clarke, R.H.; J. Valentin (2009). "The History of ICRP and the Evolution of its Policies" (PDF). Annals of the ICRP. ICRP Publication 109. 39 (1): 75–110. doi:10.1016/j.icrp.2009.07.009. Retrieved 12 May 2012. ^ Rutherford, Ernest (6 October 1910). "Radium Standards and Nomenclature". Nature. 84 (2136): 430–431. Bibcode:1910Natur..84..430R. doi:10.1038/084430a0. ^ 10 CFR 20.1005. US Nuclear Regulatory Commission. 2009. ^ a b c Patel, S.B. (2000). Nuclear physics: an introduction. New Delhi: New Age International. pp. 62–72. ISBN 978-81-224-0125-7. ^ Cetnar, Jerzy (May 2006). "General solution of Bateman equations for nuclear transmutations". Annals of Nuclear Energy. 33 (7): 640–645. doi:10.1016/j.anucene.2006.02.004. ^ K.S. Krane (1988). Introductory Nuclear Physics. John Wiley & Sons Inc. p. 164. ISBN 978-0-471-80553-3. ^ Wang, B.; et al. (2006). "Change of the 7Be electron capture half-life in metallic environments". The European Physical Journal A. 28 (3): 375–377. Bibcode:2006EPJA...28..375W. doi:10.1140/epja/i2006-10068-x. ISSN 1434-6001. ^ Jung, M.; et al. (1992). "First observation of bound-state β− decay". Physical Review Letters. 69 (15): 2164–2167. Bibcode:1992PhRvL..69.2164J. doi:10.1103/PhysRevLett.69.2164. ISSN 0031-9007. PMID 10046415. ^ Smoliar, M.I. ; Walker, R.J.; Morgan, J.W. (1996). "Re-Os ages of group IIA, IIIA, IVA, and IVB iron meteorites". Science. 271 (5252): 1099–1102. Bibcode:1996Sci...271.1099S. doi:10.1126/science.271.5252.1099. ^ Bosch, F.; et al. (1996). "Observation of bound-state β– decay of fully ionized 187Re:187Re-187Os Cosmochronometry". Physical Review Letters. 77 (26): 5190–5193. Bibcode:1996PhRvL..77.5190B. doi:10.1103/PhysRevLett.77.5190. PMID 10062738. ^ Emery, G.T. (1972). "Perturbation of Nuclear Decay Rates". Annual Review of Nuclear Science. 22: 165–202. Bibcode:1972ARNPS..22..165E. doi:10.1146/annurev.ns.22.120172.001121. ^ "The mystery of varying nuclear decay". Physics World. 2 October 2008. ^ Jenkins, Jere H.; Fischbach, Ephraim (2009). "Perturbation of Nuclear Decay Rates During the Solar Flare of 13 December 2006". Astroparticle Physics. 31 (6): 407–411. arXiv:0808.3156. Bibcode:2009APh....31..407J. doi:10.1016/j.astropartphys.2009.04.005. ^ Jenkins, J.H. ; Fischbach, Ephraim; Buncher, John B.; Gruenwald, John T.; Krause, Dennis E.; Mattes, Joshua J. (2009). "Evidence of correlations between nuclear decay rates and Earth–Sun distance". Astroparticle Physics. 32 (1): 42–46. arXiv:0808.3283. Bibcode:2009APh....32...42J. doi:10.1016/j.astropartphys.2009.05.004. ^ Norman, E.B. ; Browne, Edgardo; Shugart, Howard A.; Joshi, Tenzing H.; Firestone, Richard B. (2009). "Evidence against correlations between nuclear decay rates and Earth–Sun distance" (PDF). Astroparticle Physics. 31 (2): 135–137. arXiv:0810.3265. Bibcode:2009APh....31..135N. doi:10.1016/j.astropartphys.2008.12.004. ^ Sturrock, P.A. ; Steinitz, G.; Fischbach, E.; Javorsek, D.; Jenkins, J.H. (2012). "Analysis of gamma radiation from a radon source: Indications of a solar influence". Astroparticle Physics. 36 (1): 18–25. arXiv:1205.0205. Bibcode:2012APh....36...18S. doi:10.1016/j.astropartphys.2012.04.009. ISSN 0927-6505. ^ Pommé, S.; Lutter, G.; Marouli, M.; Kossert, K.; Nähle, O. (1 January 2018). "On the claim of modulations in radon decay and their association with solar rotation". Astroparticle Physics. 97: 38–45. Bibcode:2018APh....97...38P. doi:10.1016/j.astropartphys.2017.10.011. ISSN 0927-6505. ^ Kienle P, Bosch F, Bühler P, Faestermanna T, Litvinov Yu.A., Winckler N, et al. (2013). "High-resolution measurement of the time-modulated orbital electron capture and of the β+ decay of hydrogen-like 142Pm60+ ions". Physics Letters B. 726 (4–5): 638–645. arXiv:1309.7294. Bibcode:2013PhLB..726..638K. doi:10.1016/j.physletb.2013.09.033. ISSN 0370-2693. ^ Giunti, Carlo (2009). "The GSI Time Anomaly: Facts and Fiction". Nuclear Physics B: Proceedings Supplements. 188: 43–45. arXiv:0812.1887. Bibcode:2009NuPhS.188...43G. doi:10.1016/j.nuclphysbps.2009.02.009. ISSN 0920-5632. ^ Gal, Avraham (2016). "Neutrino Signals in Electron-Capture Storage-Ring Experiments". Symmetry. 8 (6): 49. arXiv:1407.1789. doi:10.3390/sym8060049. ISSN 2073-8994. ^ Clayton, Donald D. (1983). Principles of Stellar Evolution and Nucleosynthesis (2nd ed.). University of Chicago Press. p. 75. ISBN 978-0-226-10953-4. ^ Bolt, B.A. ; Packard, R.E. ; Price, P.B. (2007). "John H. Reynolds, Physics: Berkeley". The University of California, Berkeley. Retrieved 1 October 2007. ^ Szilard, Leó; Chalmers, Thomas A. (1934). "Chemical separation of the radioactive element from its bombarded isotope in the Fermi effect". Nature. 134 (3386): 462. Bibcode:1934Natur.134..462S. doi:10.1038/134462b0. Beach, Chandler B., ed. (1914). "Becquerel Rays" . The New Student's Reference Work . Chicago: F. E. Compton and Co.